Michelle and Barack Obama Were Feeling the Music at the Beyoncé and Jay-Z ShowPower couple is fan of other power couple. The Obamas Will Produce Movies and Shows for NetflixWelcome to Higher Ground Productions. 7 Shows We’d Like to See From the Obamas on NetflixWe’ve got some ideas for the potential Obama-Netflix collaboration. Barack and Michelle Obama’s Official Portraits Are RevealedPainted by Kehinde Wiley and Amy Sherald. This Is How the Obamas Are Spending Their SummerObama is America’s vacation-dad-in-chief. The Obamas Are Hanging With Oprah and Tom Hanks on a YachtThey’re touring French Polynesia, apparently. The Obamas Visited Malia and Sasha’s Old Swing SetThey originally offered it to Donald Trump’s family. First Lady Michelle Obama Shares a Sweet Throwback Photo of the ObamasMy, how the years have flown by. Sasha Obama Had a Good Reason for Skipping Her Dad’s Farewell AddressStill, the Internet wondered: #whereissasha? Guess Who Ivanka Trump and Jared Kushner’s New D.C. Neighbors AreImagine the block parties. Watch the Obamas Attempt the ‘Thriller’ DanceYour body starts to shiver. 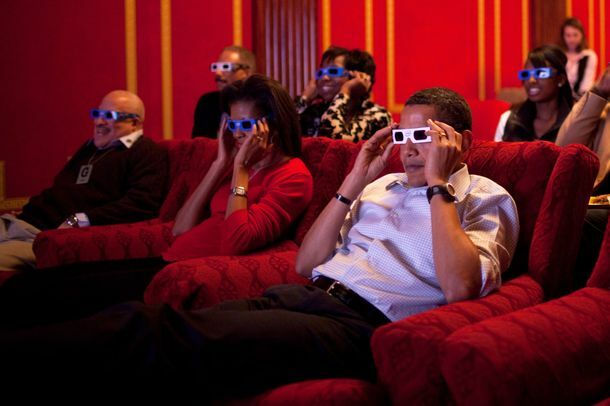 Barack Obama Can’t Watch Olympic GymnasticsWe feel you, Barack. Michelle Obama Wishes Barack Happy Birthday, Melts All Our HeartsDon’t leave, Mom and Dad. Yes, Even Sasha Obama Needed to Get a Summer JobThe first teen is working at seafood restaurant Nancy’s on Martha’s Vineyard. Barack and Michelle Obama Had a MomentWe’re really going to miss Barack and Michelle. Barack Obama Sings ‘Happy Birthday’ to Malia“It’s a job of a father to embarrass his daughter,” Obama said. Justin Trudeau Just Found Another Excuse to Do Push-ups in PublicBecause we all know Trudeau wouldn’t pass up an opportunity to show off his physical prowess in public. Southside With You Trailer: Barack and Michelle Go on a Date! Swoon. How to Vacation Like an Obama on Martha’s VineyardGet ready for a lot of golf. The Obamas’ Guide to NYC: Why the First Family Should Probably Move to BrooklynThe president is reportedly eyeing New York City after the White House. We’ve got some ideas. Michelle Obama Staying Where It’s WarmHawaii. Obama Family Photo Album Accidentally Delivered to Random Midwestern WomanIt was a Christmas gift for a family member in Chicago. The Obamas Made It to HawaiiChristmas vacation has officially begun. Here’s the 2013 White House Christmas Card, Featuring Pop-up PuppiesFrom Bo, Sunny, and the rest of the Obamas. Barbara Walters Asks Obamas About ‘Keeping the Fire Alive’For their fourth interview, she’s getting personal. President Obama Will Be Back From Hawaii Before You Know ItHis Christmas vacation will only last four days. Bo Obama Wears a Santa Hat, Inspects the White HouseAW. The Obamas Finally Got Their Mitt Romney–Free Anniversary CelebrationRomantic. Now No One Will Ever Forget Where the Obamas Had Their First KissA 3,000-pound commemorative boulder and plaque were placed on the site. Sally Quinn Asks, ‘Did a Lack of Good Parties Shut Down D.C.’s Power Circuits?’Or maybe it was the other way around. New Book Purports to Unburden the Obamas of Their Dirty LaundryBring your oversize salt shaker. Times Review Dubs Jodi Kantor’s Obama Book ‘Chick Nonfiction’Naturally, that’s getting more attention than the otherwise positive review. Jodi Kantor Talks About White House Blowback on Her Book, The ObamasIntel talked to the author of a much-discussed book about the presidential marriage. Michelle Obama Says She Never Clashed With Rahm EmanuelThe First Lady responds to Jodi Kantor’s book. The Obama Girls Are All Grown UpThat’s what they think, anyway. Even the Obamas Are Poorer This YearOf course, it’s all relative.